Use the SupervisorAn agent with the supplementary privileges required to create FAQ categories and answers, monitor agent interactions in progress, listen to recordings of previous interactions, and create reports for the agents groups they supervise. 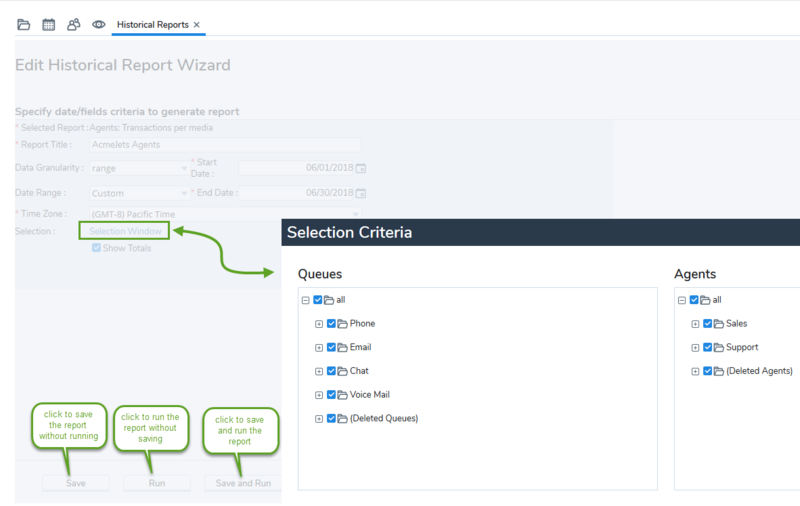 Console reporting function to create historical reports, or extract data for your contact center's Groups, Agents, Queues, ChannelPhone, email, or Web chat interactions arrive at a tenant on a channel. Virtual Contact Center uses skills based routing rules to place interaction requests into the appropriate Queue., and Campaigns. This data can be used to assess the performance of your Virtual Contact CenterA contact center that enables agents to be located in different geographical locations yet managed as if they were located in the same physical location..
As a supervisor, you can generate historical reports to assess the performance of Virtual Contact Center. Supervisors can access the Historical Report Wizard tool to easily select from scores of pre-defined report templates, customize the reporting parameters, and save them for reuse or duplication. The reporting supports named filter templates to ease repetitive tasks. If you have restricted access to historical reports, you see historical data only pertaining to the groups and queues you supervise or are a member of. When you generate a report, Supervisor Console exports the report to Microsoft Excel. You can then print the report, customize the report's appearance, or export the report from Excel in a format (such as CSV) for import into another program. Log in to Supervisor Console as a supervisor. Only supervisors can generate historical reports. From the Control Panel menu, select Report. 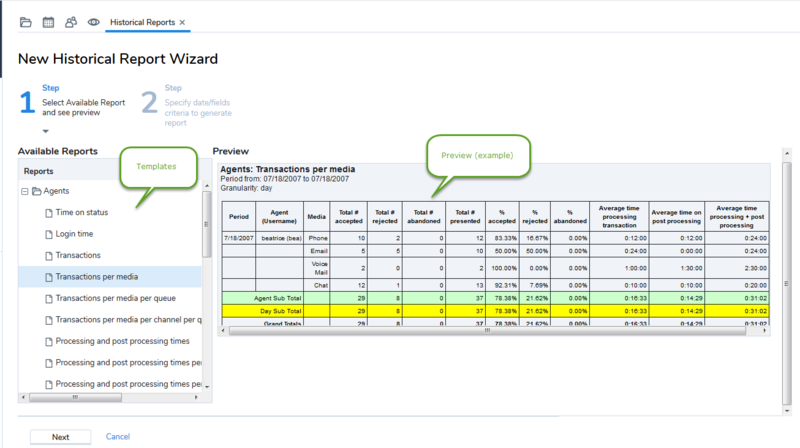 The New Historical Reports Wizard opens and walks you through the steps to generate a new report. In Step 1, choose a template from the list. In the Preview area, Supervisor Console displays simulated data in an example of the selected report's layout. Based on your selection, use the Selection tool to specify QueueA queue is an ordered collection of interactions waiting to be served by agents qualified to respond to these interactions. In addition to enabling the call center administrator to customize how incoming interactions are prioritized and routed, queues also ensure that interactions are never lost or discarded. selection or AgentAgents use the Agent Console to view and manage customer interactions. Virtual Contact Center supports Regular agents and Supervisor agents. selection. You can include or exclude deleted agents and queues information in the reports. For details on access to deleted agents and queues, refer to Generate Reports on Deleted Queues and Agents. If you chose range, in the Date Range list choose a standard date range or choose custom. If you chose custom, in the Start Date and End Date calendars, choose the first and last dates included in the custom date range. The Supervisor Console generates the report, exports the report as a Microsoft Excel file.